I love finding some fashion steals on eBay. There’s nothing more satisfying knowing you’ve got a banging outfit that you barely had to spend a penny on. As summer rolls around I thought I’d put together some of the best bits on there right now, all for under £15. Sandals for summer are a must. These beauties are super cute and will cost you under a tenner, so if they only last one Summer or don’t get many wears because, let’s be honest, how much of the UK’s Summer actually spent being sunny enough for sandals, it doesn’t matter! I can’t believe this beauty only costs £4. Of course, buying on eBay comes with a bit of a risk on quality, but I really can’t see this dress going too wrong! I adore the print of this dress, and better yet, it comes in green and red too! Can I have them all? I love a bit of the bardot trend for the summer, and I can see this blouse being the perfect number to chuck on with some jeans for some evening drinks. Another absolute beauty. Thus button-up dress is so classic and perfect for under a tenner. If red isn’t your thing, they have this in so many different colours! I’ve seen these funky sunnies all over the blogosphere lately. Although I’m totally not cool enough to pull these off, it’s worth giving them a go for just £3.99 right? We’ve all seen the straw bag trend this Spring/Summer. This one, in particular, is a dupe of one from Zara last year. I love the long strap, perfect day-time size and the cute little pom poms! This is the ideal daytime dress, perfect with some espadrilles and a little cross body bag. This dress has got to be my absolute favourite of the lot. From the colour to the buttons, to the tie-up waist, it is just dreamy. That’s going straight in my basket! And finally the straw bag of all straw bags, this is a dupe of all those ones we’ve seen on the high street recently, and for a fraction of the price. You’d be daft not to! 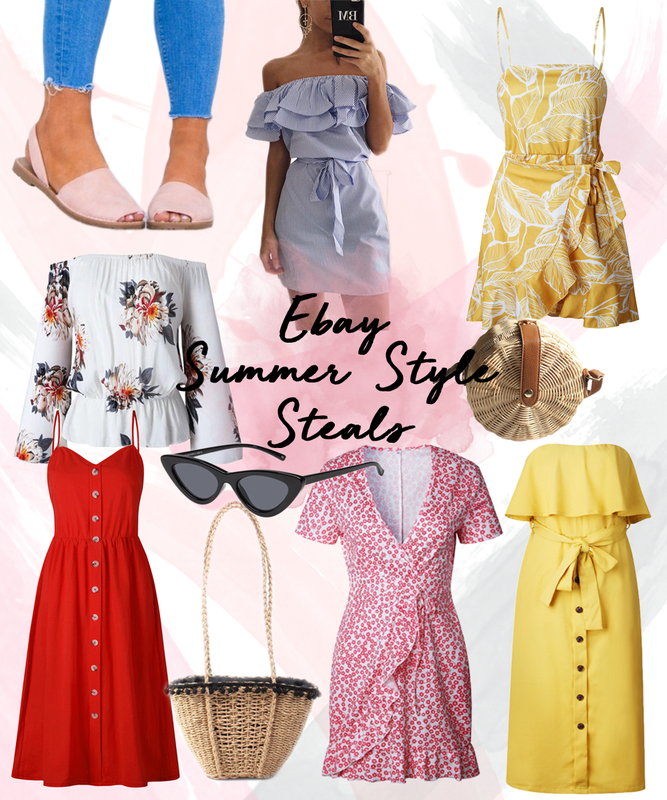 Do you use eBay to shop for clothes? Will you be giving any of these a go? "Getting my Summer wardrobe ready"